& I know that everyone says this, but I really don’t like it. January is the month where it seems that everyone has to be super positive and super happy all of the time. January is the month that we are supposed to modify ourselves. ‘New Year, New Me’ etc etc. January is the month of fitness changes, goal settings and new beginnings. For me, January is filled with sadness. January reminds me of my nanny who sadly passed, almost 3 years ago now. I still think about her every single day. 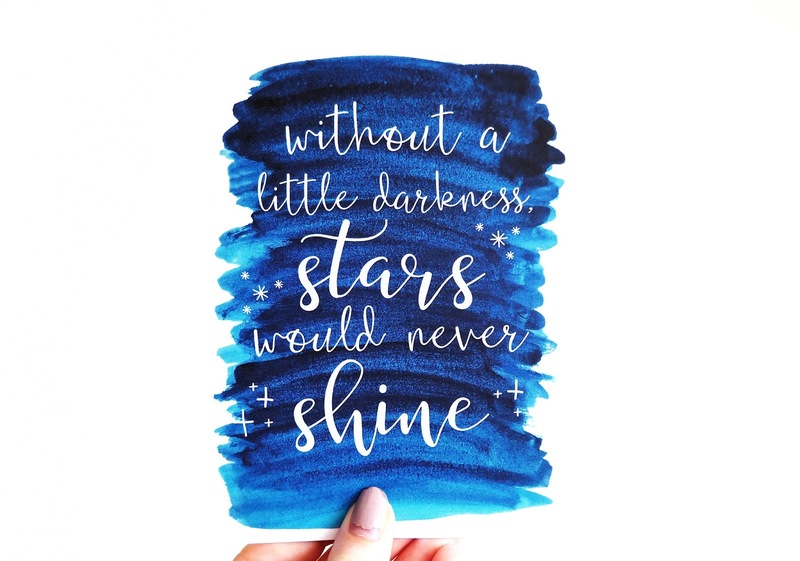 Without a little darkness, stars would never shine. Sad moments in our life, shape us. They let us truly appreciate the good times in life and teach us to not take happiness for granted. This awesome design print from That Lame Company always reminds me of this message. I love it. I find it quite hard to ‘get up and go’ during January, particularly when thinking about how I would like to fulfil the year ahead. Most of you know that I suffer with OCD, but I was originally diagnosed because the doctors noticed I would act out compulsions, in order to prevent death. I have a huge fear of getting a terminal illness and dying – I think about it even more towards the start of the year. I’ve always been a bit of a worrier, but this heightened even more after losing my nanny. When my OCD was at it’s most severe, about 2-3 years ago now, I constantly thought I was going to die each week and therefore there wouldn’t be any point in creating goals for the rest of the year. Not a great mindset to have, eh? I’m a lot better now, not perfect of course, I still have my health anxiety blips, but I think everyone has a scare once in a while. I read a lot and I meditate, they both truly help me. Also, something my doctor said to me back in September really stuck with me. ‘You could get hit by a bus and die tomorrow’ which made me think. He is right. I’m my own worst enemy. If you could all hear what I say to myself you would be shocked. Why do we hate on ourselves so much? In 2017, I want to give myself the advice and care that I would to a friend. If I don’t blog for over a week or if I need to up my medication dose, so be it? I didn’t leave the country in 2015, or 2016 but I did visit a lot of new lovely places within the UK, including Chester, Knaresborough and York. I’d like to do this again throughout the year. I want to see the world. It’s beautiful. I hope Jordan and I book a few city breaks to explore explore explore in 2017. On our list we have Dublin, Barcelona, Amsterdam and Florence. It’s all very exciting! In order to explore the world…. I need a job don’t I? I’ve been applying for jobs for about 7 months now. I must admit, so far I have been rather picky in the application process. I am desperate to work in a graphic design role, it is my love, my passion. Unfortunately I am reaching the point where I do just need to get myself a job, there are bills to pay! Next week I am broadening my horizons, looking for jobs in admin and retail, wherever I can in order to get myself out there. It doesn’t have to be a permanent decision. You can always change direction. THIS will help me get onto the design career ladder. My housemate from last year has inspired me on this one. Whilst Hen is unemployed she designs something new each and every day and posts it onto her Instagram. It is a brilliant way to keep building up her skills and portfolio. No creative restrictions, I will be able to design WHATEVER I like. One day a logo? The next day a children’s book character? The one after that… some blogging merch? (not promising anything guys…..) I am excited to begin this project and see where it takes me. Big places I hope! This one might sit quite randomly within this list, but it is simply something I want to do. I’d be lying if I said I was body confident and happy in my figure at the moment. I know what you’re thinking, WHY THE FLIP WOULD YOU WANT TO STRIP DOWN TO A SWIMMING COSTUME THEN. This does cross my mind, but I’m just not a gym person. I’m a pisces. I’m a water baby. I love to swim. I’ve got my shiny new swimming costume and goggles ready to go swimming, when *lady time* is over. I hope to go 2-3 times a week, and gradually increase the distance each time. I want to FEEL fitter and healthier, no more running out of breath running up the stairs please. I’m probably not the only one guilty of this. We grow up. We drift apart. Someone will text me and I might read it and then not reply for like a week. I am RUBBISH at texting – I want to change this and meet up with people more in person. REAL LIFE COMMUNICATION. In 2017, if someone constantly says they are too busy to see me, I will get the message. Kaynay is no longer a doormat! – If I’m not worth their time, they aren’t worth mine. I will then have MORE time to spend on people who do wish to share my company. If you really want to keep in contact with someone you WILL find the time. Vice versa. This post started out on a bit of a downer…. but it turned out happy in the end! What would you put in your action plan for 2017? I’d love to know. Let me know in the comments! New year, same me, just me being kinder to myself. Love this post, so real! Amazing goals for the year, they are very similar to mine! Also, this print is beautiful! Lovely post, I also am very scared of getting a terminal illness and dying, given it may not be as bad but its such an awful thing to suffer with. Even if I wake up feeling ill one day, I have a complete meltdown and my anxiety goes through the roof, so I understand. Although I hope 2017 is a positive one for you, and you manage to get yourself a job you enjoy! So much love for this post! Not only is that print gorgeous, but the quote is so, so true and relatable. I always enjoy reading your positive outlook and determination! It took me a while to get a job after graduating, but the wait was so worth it and I just know that you're going to go far lady! Love the post, relatable and inspiring. Nice topic selection. Thank your sharing your ides here. Your post made my time more enjoyable.From your post I could comprehend that you have well thought. You need to attempt to include more inventiveness in your post.